Christmas came early for Larry, one of our African spurred tortoises, after keepers served up some festive food for the tortoise group. 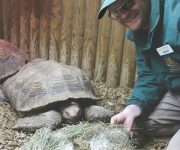 Senior Keeper Sarah Evans and Keeper Adam Davey (pictured) mixed the tortoises’ regular 450g serving of nutritious pellets with water and shaped it into decorative holly leaves to get into the festive spirit. … Continue reading Merry munching Larry!